Love doing custom, one of a kind projects but you never quite know what you’re getting yourself into! A concern with this project was being able to fit everything into the space available. For that reason the stand for the utility sink has been kept to the minimum size possible. After taking the washer and dryer out (still available on Craigslist as of now) I went to work removing the drywall. The dryer outlet you see at the right has been repositioned to the area above the water. See the brick exposed on the left side; that was the original house! We couldn’t figure out why they hadn’t put an electrical outlet closer to the built-in ironing board (white cabinet on left), it was a hassle reaching over the washing machine to plug in the iron. After missing the water pipe buried by that brick wall by inches I was able to fish a wire through and install a surface mounted outlet there — would have been a disaster had I hit that pipe. We hired a plumber to do the rough plumbing behind the wall. As for the sink stand it’s now complete. Since the top and base were kept to the minimum size the challenge was how to mount the top and sink to the base. The sink uses standard mounting with clips that attach it to the top. It ended up that notches were needed for the clips to clear. Quickly done with a Japanese razor saw and chisel. The apron had been pre-drilled before the stand was put together, in the right hand picture I’m locating the holes for the attaching screws. Notches for sink clips, tape is the depth stop! There is a grid work shelf at the bottom of the stand. The location of it was determined by the height of the library type step stool needed so that we can access the dryer stacked on top of the washing machine. This will make connecting the drain somewhat tricky due to limited space. 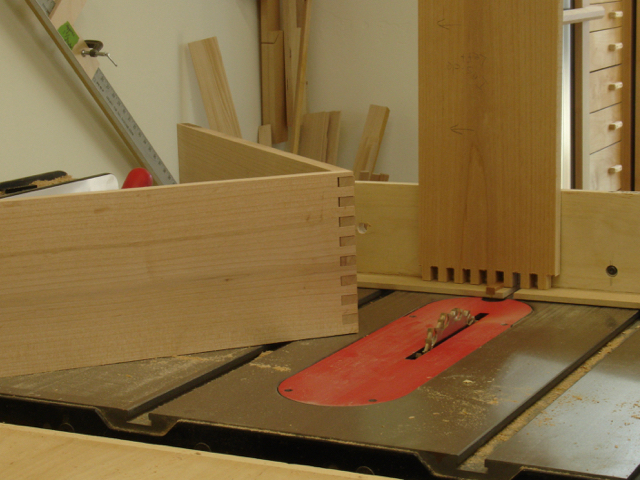 The grid is made of 3/8″ and 3/4″ pieces of Alder which were taped together and notched with a dado set on the tablesaw. The final step before the finishing was making the finger jointed apron that goes around the top of the stand. Here’s where I really appreciate the sliding table on the SawStop and the jig I made for cutting the finger joints. Here’s a LINK to that blog. In keeping with the antique school desk inspiration, it’s attached with screws and then plugged. The final step was applying the finish. Although water and wood aren’t the best combination a laminate top wasn’t in the plans. There are 5 coats of General Finishes semi-gloss exterior sprayed on which should be sufficient to protect it especially since the sink has that built in drain board. Just need to be conscientious about wiping off any spills as they happen. So, what’s left? 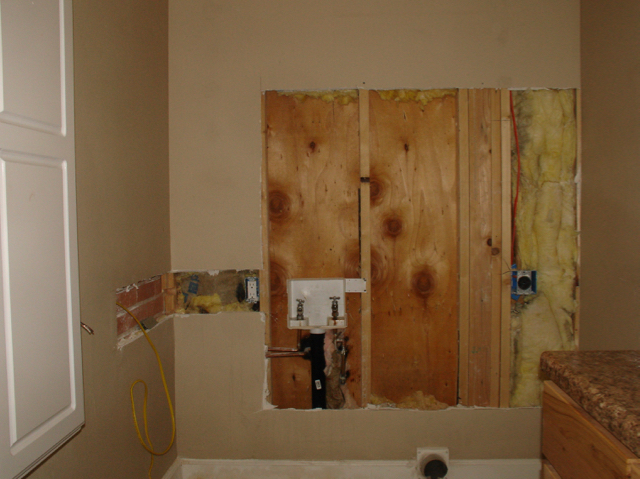 plumbing, drywall, paint, tile backsplash, new units installed and bada boom, bada bing — we can wash our clothes again! This entry was posted in Home Remodel, Utility Sink and tagged counterbored and plugged screwholes, finger joint jig, finger joints, General Finishes, General Finishes Exterior, grillwork, rolling step stool, SawStop, utility sink stand. Bookmark the permalink. Ah, the joys of the simple remodel. One project becomes ten before you know it. Looks like your on the downhill side though. I’m looking forward to seeing the sink base all together. Yep, is there such a thing as a “simple remodel”? I’m with you on looking forward to seeing it all together. Plumber finished this morning and I drywalled this afternoon. Have the same guy doing the tape and texture I had do the shop — next weeks schedule.